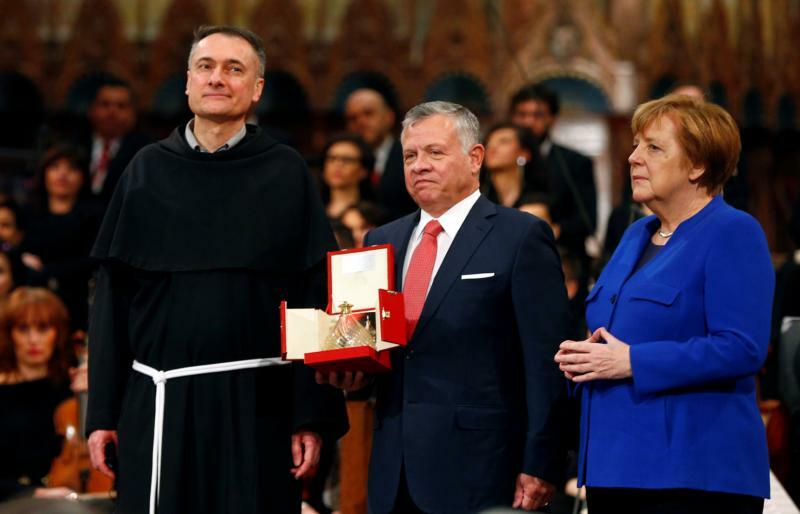 AMMAN, Jordan (CNS) — Jordan’s King Abdullah II urged greater cooperation to take on serious challenges worldwide as he was awarded a top Catholic peace prize by the Conventual Franciscans of the Sacred Convent of Assisi in central Italy. “It is only by combining our efforts that humanity will meet today’s serious challenges — to solve global crises; heal our earth’s environment; and include everyone, especially our youth, in opportunity,” the king told the assembly. Among the crowd were last year’s award recipient, German Chancellor Angela Merkel, and Italian Prime Minister Giuseppe Conte. Franciscan Father Mauro Gambetti presented the Lamp of Peace to the king. He is the custodian of the Muslim and Christian holy sites in Jerusalem, a position held by his dynasty since 1924. The king also highlighted the need to resolve the Palestinian-Israeli crisis and safeguard Jerusalem. “I am bound by a special, personal duty to the security and future of the holy city,” he said. His reconciliation efforts sharply contrast with other world leaders who, at this time, are taking up increasingly divisive positions on a host of important issues, including migration. If the king’s example were followed, the world and, especially the Middle East, would be a better place to live in, said Msgr. Khaled Akasheh of the Pontifical Council for Interreligious Dialogue at the Vatican. “His Majesty is a person with compassion toward all who suffer; he loves peace and works for it with determination, respects all religions and their followers and is very attentive to the Christian community in the Middle East and in Jordan in particular, encouraging Christians to remain in the land of their fathers and grandfathers,” Msgr. Akasheh told the Jordan Times newspaper March 27, 2019. Jordan, under the king’s leadership, spearheaded the Amman Message, calling for tolerance and unity in the Muslim world; the World Interfaith Harmony Week; and the Common Word Initiative, which promotes respect between Muslim and Christian religious thought. The Aqaba Process, initiated by Abdullah, coordinates global efforts to combat extremism and terrorism. Since its launch in 1981, the Lamp of Peace has been awarded to those seeking the peaceful coexistence of people. It has been granted to several political and religious leaders, most notably trade unionist and former Polish President Lech Walesa, former Colombian President Juan Manuel Santos, Pope Francis, St. John Paul II, the Dalai Lama, St. Teresa of Kolkata and Palestinian President Mahmoud Abbas. The Lamp of Peace is a replica of a local glass oil lamp that glows at the grave of St. Francis of Assisi, who lived until 1226 and whose observations of wildlife inspired environmental ethics. Traditionally used in Italy’s central Umbria region, where Assisi is found, the small lamp contains local olive oil, considered a symbol of peace.